for latest updates, please visit our Facebook page or give us a call on 02393 200403. Thank you. The 20m swimming pool caters for every swimmer. The pools is perfect for lane swimming, aqua fitness, learning to swim or just for splashing around. Learn to swim with the BH Live Swimming Academy and gain a skill for life! There’s tuition to meet all abilities and the academy operates from the following centres in term time and school holidays. Our swimming lessons start from junior stage 1 and go through to Stage 9, plus adult lessons. Lessons run for 50 weeks of the year, and you can join any time! For more information, please get in touch. 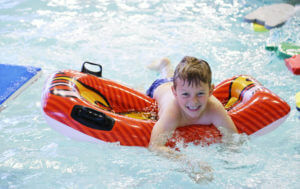 Have fun in the pool with inflatable pool toys, giant play mats and lots of other fun equipment. Background music adds to the atmosphere too! Socalise with us, receive our newsletter and find a contact. Sign up to our marketing updates and receive the latest health & wellbeing news, fitness and nutrition blogs, special offers plus much more. We ask for your date of birth to ensure that we don’t market inappropriately to minors.